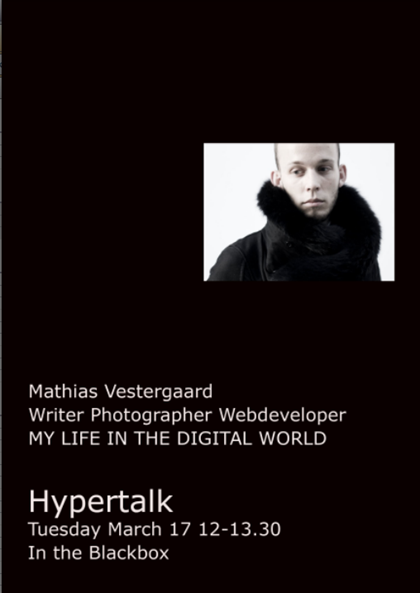 Hypertalk: digital life style _ Mathias Vestergaard Corp.
After my speech, one of the students asked me “What would be the link between your ultimate ideals and your fashion projects?” Somewhat startled, I tried to answer the best I could. Nonetheless, it is not always that easy to link my actual work to my ideals. In the end, I don’t want to betray my ideals nor do I want to change my work or projects. My answer therefore was two folded.Firstly, I am still learning. Learning to change the world of fashion or the world of boy scouts. Secondly, given the nature of my projects, I get to speak to a lot of people. Sometimes directly as I did today or at times, indirectly through the media, interviews and articles. Nonetheless, I always try to inspire the people I meet. Therefore, even if I fail in my objectives and do get caught up merely fostering my own business, I might still have inspired 10 others to go out and make a difference. In the end, that would thus bridge the inevitable gap between fashion and ideals. This entry was filed under Blog, Entrepreneurship, Talks.